This honeyed snack mix has the same taste reminiscent of old-fashioned popcorn balls. 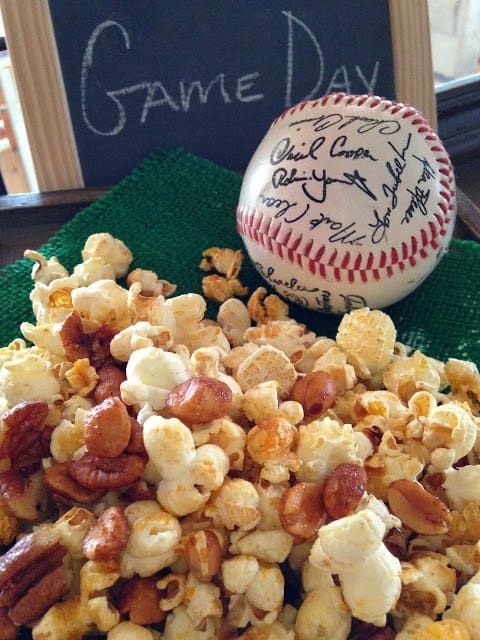 This popcorn and peanut mix is much easier to make, so make a big bowl of this snack mix to munch on while your cheering on your favorite team. 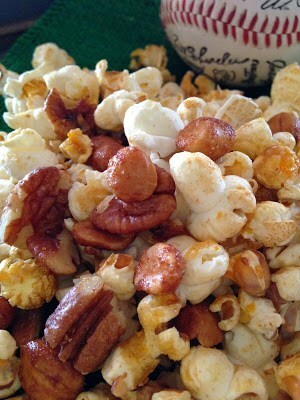 The honey roasted peanuts, along with the honey and orange juice adds fantastic flavor to this popcorn/peanut snack mix. The combination of all flavors come together wonderfully and will leave you wanting more and more! Place popcorn, honey roasted peanuts, and pecans in a large roasting pan. In a medium microwave safe bowl, stir together the honey, orange juice, butter, orange zest and cinnamon. Heat on high for 1 to 2 minutes or until hot and bubbly. Drizzle the honey mixture over popcorn and nuts. Bake for 45 minutes, stirring every 15 minutes. Spread popcorn mixture on a large sheet of foil. Cool completely. Colorful Mini Velvet Cakes are the absolute perfect Easter Sunday cakes. That looks so delicious! I love snacks like this. The company I work for has been instrumental in bringing a AAA baseball team to our town and building a new stadium. We are all excited to get the season opener going here. 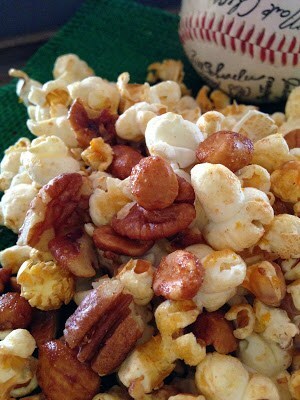 This would be a great snack to kick off the office party on opening day. Thanks! 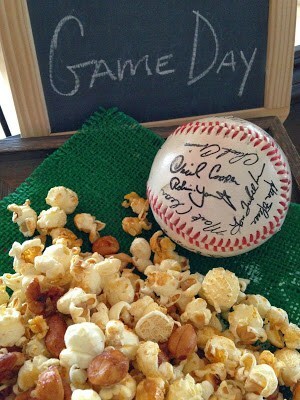 Hi Lita~ We are huge baseball fans in my family! My son played ball from the time he was 4 years old up to Legion Ball. He is a coach now:) Enjoy the Game! !